A wide angle - to get us going! Dimmer lights, surround sound, popcorn and a good game of poker - those are the buzz words for today's post! Welcome to the next stop on my (Deepa's) home tour. Previously, I've taken you through our guest room and our little boy's room. Today, we are heading to our basement for a tour of our newly transformed catch all space - media + game lounge! Chic accents = chic room! 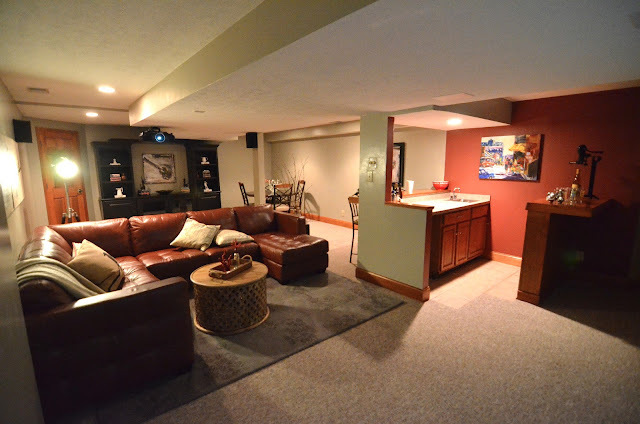 We were lucky - the previous home owners had already finished a portion of the basement and so all we were left with was adding our personal touch. 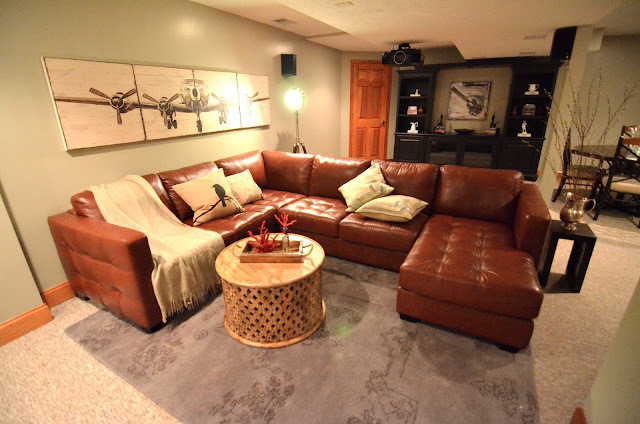 Even before I could say the word basement, my husband and son claimed this as their space! They were excitedly exchanging ideas and I didn't have the heart to interfere. However, I did stake claim to a closet in the basement. This sits underneath the staircase and has wall to wall shelving. It is a great space to store all my extra/seasonal home decor accessories and arts and craft supplies. This closet is now fondly referred to as the Aalayam closet and I love the utilitarian value of this closet! I will share a picture of this someday. 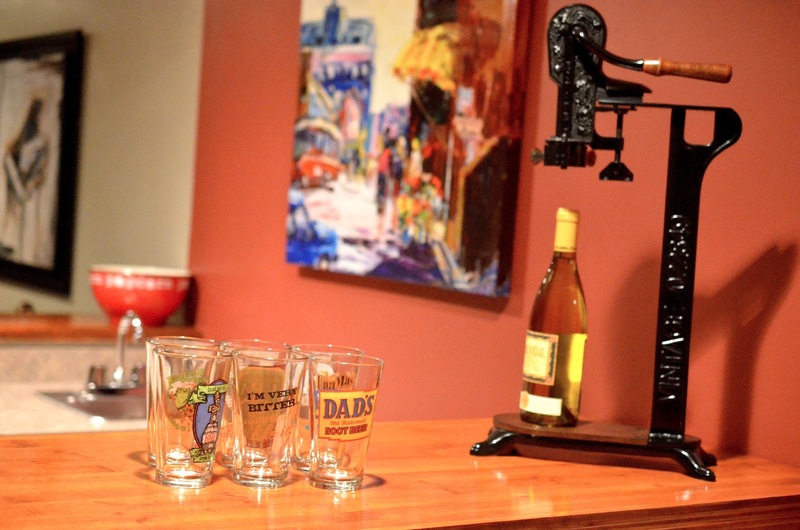 Space planning for soon-to-be men's den began in earnest. A wet bar, a game and seating area and media station were all promptly assigned to their respective corners. This room was ENTIRELY designed by my husband and is unlike any other room in our house. The rest of our house is very global in its feel and Indian in its roots (courtesy moi). This room on the other hand as an All American feel - big on style, big on comfort! Of course, with men being men, the room was first fitted with a projector and a big screen! That's right - a bare space with a big screen! I was probably the only one in the house who seemed to think that was odd. The boys lounged on the floor with a bag of chips, while the images came alive on screen aided by the surround sound and nothing else mattered! This went on for a few weeks. But eventually, my husband got down to work and the space was outfitted with all the essential elements - furniture, art work, accessories, a rug, lighting and the finishing touches!. And it all began with a well conceived, budget-savvy plan! This was his project from start to finish and I must say, I am mighty pleased. An old breakfast table was repurposed as a table for poker nights. The white accents were all gifts - reuse, repurpose, refashion! A previously used media credenza was now positioned against the back wall as a storage unit for cords, cables, gaming console accessories, dvds and books. A few select accessories were used to dress this cabinet for a stylish yet clutter free look! Mismatched accents work- don't be afraid to use what you have! 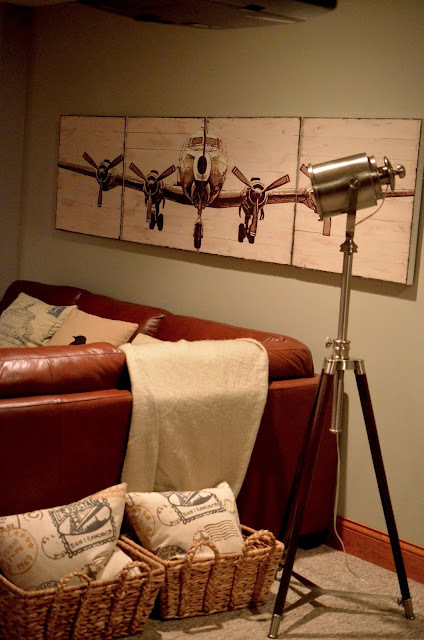 I love his choice of art work for the room - particularly this planked airplane from Pottery Barn! It sits comfortably above and across the length of the couch, grabs your attention and reflects my husband's love of travel. Perfect for his den! Tufted sofas are in and I knew he digs the tufted look but finding something that was appropriate for a media room was tricky and so, he was ecstatic when he found this tufted sectional. 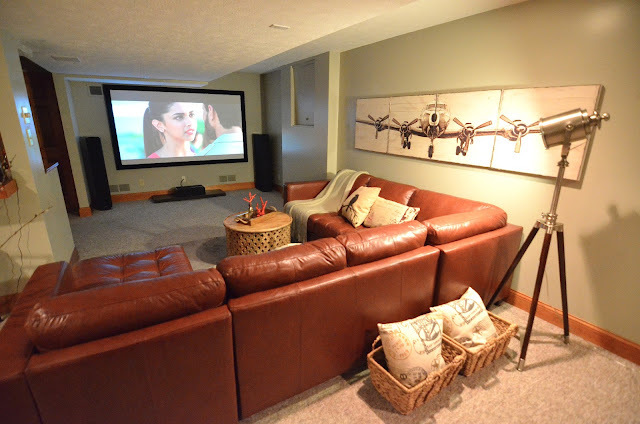 It is not too bulky, came in a gorgeous camel shade and has enough seating to allow for comfortable movie viewing. Playing with a neutral color palette can be fun too! The inherent acoustics of the room and well picked sound accessories enable a theater-like audio experience . We opted to add a screen instead of projecting the images directly on to the wall and this enhances the picture quality. We enjoy watching movies and games at home much more than heading to the movies and that has always been our thing. With a little planning and some effort we have recreated theater ambience right here at home! The wet bar area was already painted in a gorgeous dull-red. A little sprucing up was all it took to make it ready for our guests! Overall, the colors are cozy and calming leaning towards rustic and earthy. This is in stark contrast to the rest of our colorful home but works really well for this room! My favorite in the room (and it was hard to pick) has to be the coffee table , the round shape adds visual interest and the jali style wood -work incorporates just a touch of India into this otherwise western room. I picked the coffee table accessories - a couple of gorgeous coral accents . They look great as a pair and combined with a reflective metallic tray they make an eye-catching arrangement! Jali style coffee table + coral accents + metal tray = Vow? In the Dirty Picture, Vidya Balan seductively quips "Entertainment, Entertainment, Entertainment" Let's admit it! We love our Bollywood movies! And their inherent entertainment value. After all, they are so integrally woven in to our cultural tapestry. For expats like ourselves, weekend trysts with Bollywood movies is not just an exercise in unwinding but also a surefire way of clinging to our native identity. With their glitzy and flamboyant fare, Bollywood cinemas have continued to entertain native audiences for over a century now and that includes us. To revel in the Bollywood pomp and show in the comfort of our American home and to spend a cherished evening with each other is something that we as a family truly enjoy and this room enables just that! Unknowingly, life tends to creep up on us and take over at times! We lose sight of what's most important! And at those times we need to remind ourselves that snuggle-time with our families is as good as it gets! Next weekend is movie date-night and I plan on showing up in my pajamas! Hope you've enjoyed our tribute to American decor? Happy 4th folks! We have a busy busy summer ahead of us - a fabulous food blogger's home tour is up next followed by a two-part spotlight feature on a phenomenal jewelry artist and her gorgeous gorgeous home! So, do not budge! If you like our features and have friends who might be interested, please share our link and help us grow the Aalayam family! p.s: The pictures are copyrighted. Please ask before using. I like the fact that both of you are bringing different(not run-of-the-mill) ideas into spotlight.Makes for a very fresh interesting read! Love your blog.Can't wait to see more spaces from your own homes! Vidya: Thank you for you well-articulated comment. I guess, we are both just focusing on our inherent passions. I am glad that this makes for an interesting read. We know and understand that our readers have a good choice of excellent home decor/lifestyle blogs and we appreciate that you are a part of the Aalayam family. We have a busy summer- i am sure you'll love our next few features. It's pouring home tours! and yes, eventually we will feature more of our own homes. A friend writes (in her email to me)... "Nice article Deepa. I just want to go to your media room now and relax! Well done media room and well written article. Kudos to your time and effort"
Deepa, what a beautiful space to unwind and relax. Everything looks great specially love that lamp. So chic!! Deepa, I see your flair for design has caught up with the rest of the family !! Love your media room.....Ujjwal's done a great job. All one can feel is 'relax & sink in '........the vintage airplane triptych is my favorite ! Nayana: Thank you! 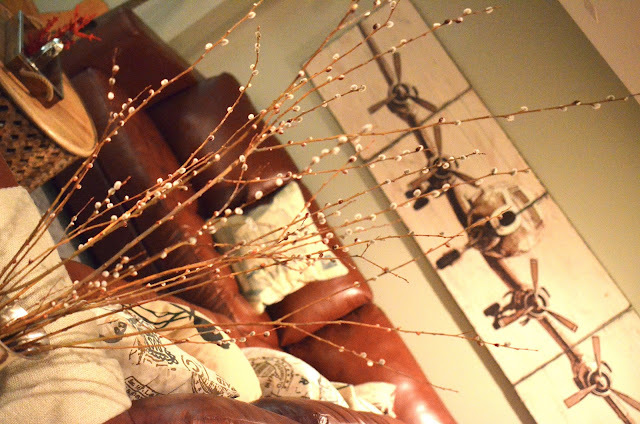 The lamp was my husband's find too - the photgrapher's tripod floor lamp from pottery barn. We wanted something that would cast powerful light (when we are not watching a movie) since the basement is otherwise dark and this works out well. The lamp itself reflects his love of photography so it is appropriate for his space :) I am glad you enjoyed this feature. Yup, relax and sink in - is it! The triptych is beautiful, I like it too. Thanks for reading and commenting Christine. Aww, Deepa - I don't know how I missed this one. Came here thru ur link from the family room post. A very elegant look. I just want to plop myself on the sofa and see Race 2 - is it? :) We have an in-law unit - which my husband has conveniently named as the 'Man Cave' - Right now all the room has is seating and dark blue and gold walls. I think he wants to add a billiards table there. Thanks Radhika! I think that was Race-2! Nice! A pool table is nice for the cold winter months - when there is not much you can do outdoors..
In-law suite sounds cool - can be a great entertaining space too.